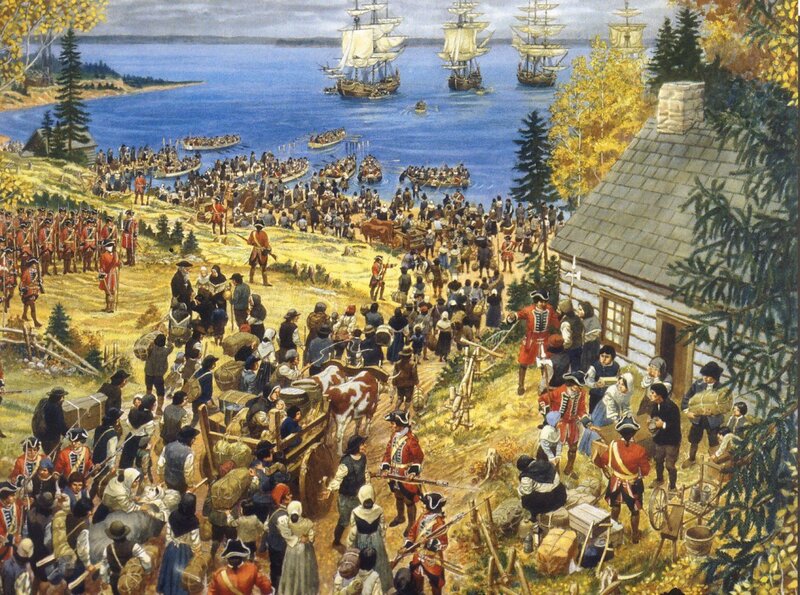 The Acadian Expulsion (1755–1764) was the forced deportation of the citizens of Acadia (an area that was spread out across modern day Nova Scotia, New Brunswick, and Prince Edward Island) by British soldiers. Although it was part of the British military campaign against France during the Seven Years’ War, the expulsion was the result of long-term hostility between the two sides. Approximately 10,000-11,500 Acadian refugees fled to Louisiana, New France, the English colonies, and some went as far as Europe or the Caribbean. Thousands died of starvation, disease, or from drowning and those who survived weren’t exactly welcomed with open arms. So how exactly did British colonial government justify their actions? This post looks at the different positions on the Expulsion from both the British and Acadian points of view. Carte De L’Acadie Contenant by Jean-Baptiste-Louis Franquelin (1702). [Source] Please click on the image for a better resolution. To learn about the map, click here! Acadia’s history stretched all the way back to when the French first arrived in the area in 1604. 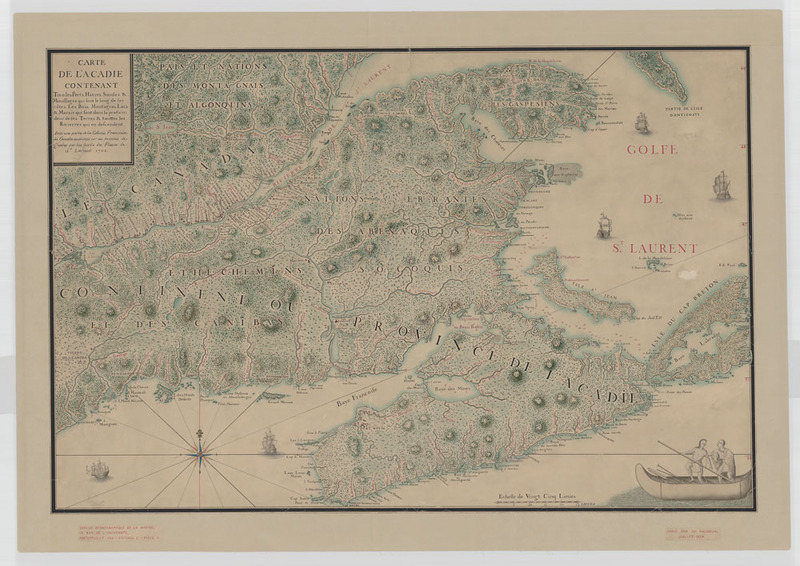 French settlers began to fill the rich farmland and overtime began to develop their own distinct culture due to the influence of the Mi’kmaq Nation and their isolation from France. Over the course of the 17th and 18th centuries, Acadia became a site of great turmoil as it not only endured six colonial wars but control over Acadia shifted back and forth between the French and the British. 1713 was a pivotal year. 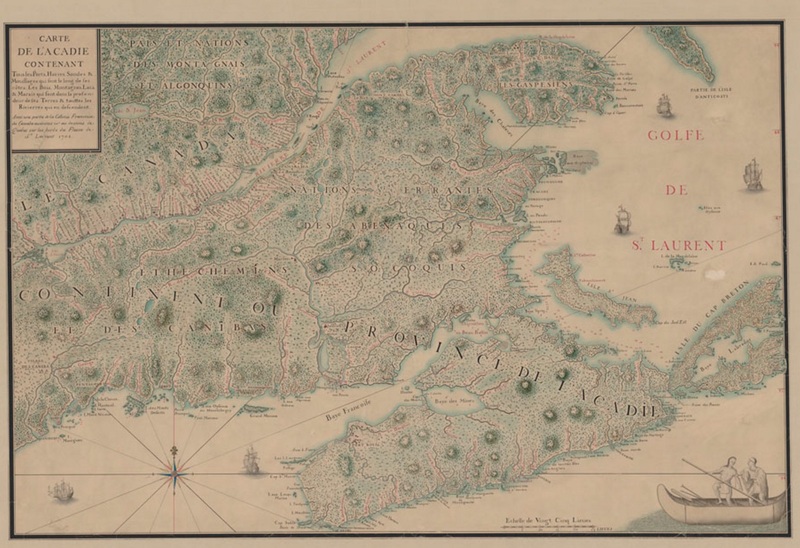 Although the Acadians were allowed to keep their land, the end of the War of Spanish Succession and the Treaty of Utretcht brought Acadia under British rule. The Acadians refused to pledge their allegiance to the British, instead they signed an oath of loyalty in 1727 on the basis of neutrality. They would remain neutral so long as they did not have take up arms against the French or the Mi’kmaq. British officials begrudgingly accepted the compromise. At the time, they lacked the military means in the region to force the Acadians to pledge allegiance. This agreement lasted for about three decades. However, when the Seven Years’ War broke out in the Ohio River Valley in 1754, the uneasy neutrality between the two sides became impossible to maintain. 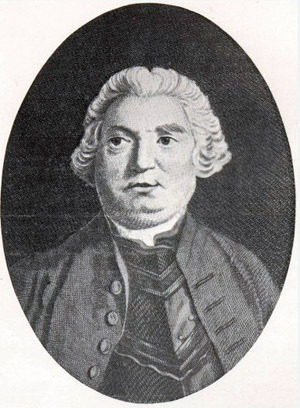 Safety of the British Colonists – As the war inched closer and closer to Acadia, Charles Lawrence, the British Lieutenant Governor in Halifax, began to view the Acadians as a security risk. The British colonists living in the area would not be safe as long as they were surrounded by thousands of people who were technically the enemy, despite their claims of neutrality. Neutrality? What Neutrality? – In the minds of Governor Lawrence and other British colonists, the Acadians had never been neutral. Aside from their ongoing relations with the Mi’kmaq, who were enemies of the British, some Acadians had been involved in Father Le Loutre’s War (1749–1755). This conflict involved guerrilla warfare against British colonists in Acadia and New England, courtesy of a militia of Mi’kmaq and Acadians, led by Father Jean-Louis Le Loutre. The illegal establishment of Halifax in 1749 (it violated a 1726 treaty with the Mi’kmaq), the militia undertook numerous raids against British towns and cities. The war saw population movements, the militarization of the area (many forts were built), and a total of 24 recorded battles and/or raids occurred. Father Jean-Louis Le Loutre, the Catholic missionary turned military leader. After Fort Beauséjour, he tried to escape back to France but the British seized his ship. He was imprisoned until the end of the Seven Years’ War and then spent the rest of his life trying to help displaced Acadians. Lack of Gratitude – The British had been exceedingly tolerant for decades. Despite the fact that they had been conquered, the Acadians had been allowed to keep their land, faith, language, and pretty much live as though the British weren’t in control. The British had put up with their pledge of neutrality and did not force the Acadians to take up arms against the Mi’kmaq. Instead of gratitude, the Acadians responded to British kindness with hostility and bloodshed. Fort Beauséjour – This battle ended Father Le Loutre’s War and brought Acadia into the Seven Years’ War. The British military campaign in this area had two goals: capture Fort Beauséjour and Fort Louisbourg. They achieved their first goal on June 16, 1755. Despite the British victory, Governor Lawrence was furious when he discovered that during the battle around 200 Acadians had been found inside a French fort. That was the last straw. Oath of Allegiance 2.0 – Governor Lawrence created a new oath of allegiance for the Acadians. Either sign it and swear full loyalty to the British crown or you and your family would be kicked out of the colony. The vast majority of Acadians refused and Governor Lawrence was left with no choice but to order their deportation. The first round began in August of 1755. Ships Take Acadians Into Exile by Claude T. Picard. Back and Forth Governance – As previously mentioned Acadia’s existence had been one of constant warfare, often as a result of being caught between the British and the French. Control over the colony went back and forth between the two and so the Acadians felt that neutrality was the best policy. Why make promises and claim allegiance to one side when one day control might suddenly shift to the opposite side? Neutrality Pledge – Despite the fact that some Acadians took up arms against the British in Father Le Loutre’s War, most of the population did not. Most upheld their oath of loyalty that they had signed in 1727. The second oath and the deportation violated the original agreement between the two sides. Also, how is it fair that the actions of a few lead to the punishment of thousands of innocent civilians? Fear of Retaliation – How could the Acadians sign the second oath? To swear allegiance to the British would make them enemies of the French and possibly the Mi’kmaq. British soldiers would defend British colonists in the event of an attack, but the Acadians? They would get massacred. They would be putting their lives greatly at risk by signing the second oath. They had to refuse and continue to insist upon neutrality. 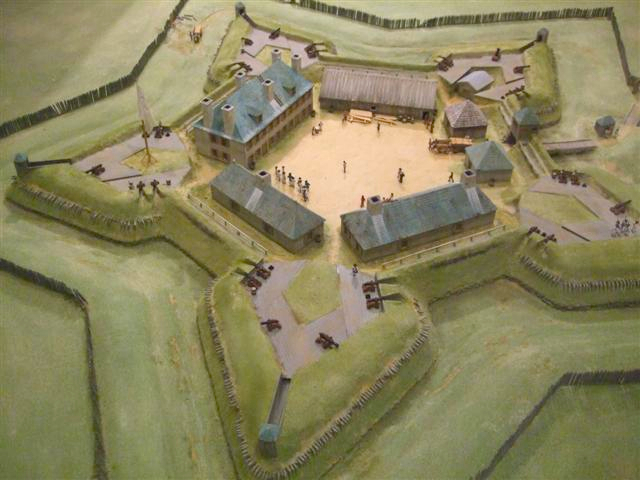 Their Side of the Story at Fort Beauséjour – Reportedly the only reason the 200 Acadians were at that French fort is because they had been forced to go there. The French and Mi’kmaq had been burning down Acadian villages and capturing Acadians to hurt the British. To them, Acadian neutrality meant they were on the side of the British and their men and crops could potentially support the British troops. As such, the presence of 200 Acadians inside the fort was not the act of betrayal that Governor Lawrence thought it was. Destruction, Not Deportation – Governor Lawrence went too far with how the deportation took place. (For example at the beginning the Acadians were surrounded when they were at church and forced by bayonet-holding British soldiers to get onto ships. They couldn’t bring any of their belongings). Their homes and crops were burned. Families were torn apart when they were set to different places. Sometimes when Acadian families arrived in British colonies, their children were taken from them. Those who fought back were killed. Governor Lawrence’s intention wasn’t to defend his territory, he wanted to destroy the Acadians as a people and give their land to British newcomers. He never wanted them to return. 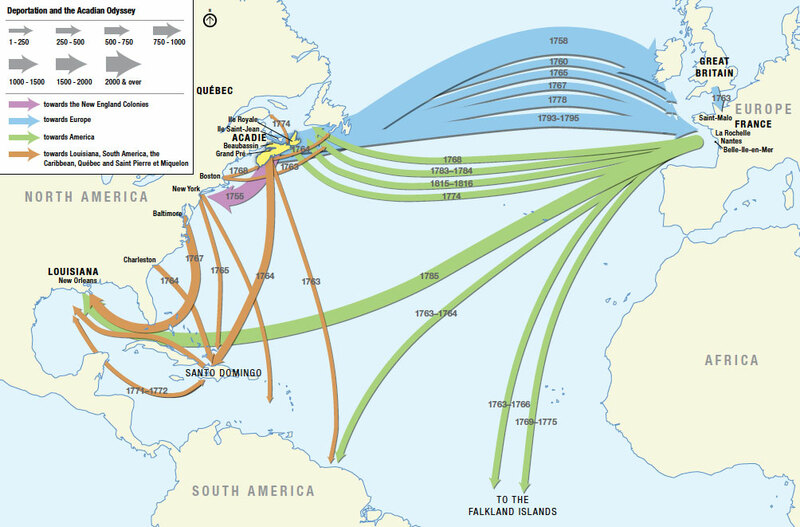 “Destinations and movements of the deportees during the Acadian Expulsion.” [Source] Sometimes their original destinations did not work out, either due to hostility or there simply was no land for them. As a result many were unable to settle and wound up destitute. Others were luckier. Small numbers of Acadians were allowed to return to the British colonies following the end of the Seven Years’ War. (Governor Lawrence was dead by this time). (Due to possible presentism issues, this gets its own section). The question of human rights and the right to a homeland sometimes arises when discussing the Acadian Expulsion. Some argue that it is unfair to throw the issue of rights into the mix. These are concepts that the British would have not been aware of at this time as the Acadian Expulsion happened before both the American and French Revolutions. However, others argue that uprooting thousands of people, destroying their families and lives, and forcing them to live as refugees have always been obviously wrong. The wrongness of these actions are basic and enduring; it doesn’t matter what century the Acadian Expulsion happened in. Mass deportation was an extreme solution and the fact that the British held off on it for so long reveals both a reluctance and an awareness of the severity of their actions. The British knew it was wrong and therefore their actions have never been justifiable. What do you think? Was Governor Lawrence justified in his deportation order or was the Acadian Expulsion wholly unjust? Is it okay to discuss human rights in relation to the deportation or is it too modern of a concept? Note: I want to thank everyone who have shared their thoughts and stories regarding the Acadian Expulsion. As this is an old article, I will be turning off comments. This post is the second installment of my seven-part series on the Seven Years’ War. Faragher, John M., A Great and Noble Scheme: The Tragic Story of the Expulsion of the French Acadians from Their American Homeland. New York: WW Norton & Company. 2006. Hodson, Christopher, The Acadian Diaspora: An Eighteenth-Century History. Oxford: Oxford University Press. 2012. Marsh, James. “The Deportation of the Acadians.” The Canadian Encyclopedia. (2013). 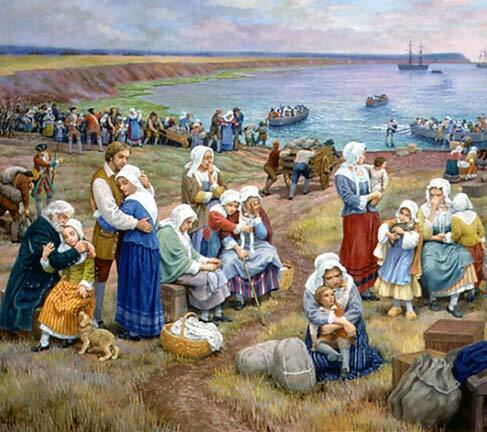 Accessed from: http://www.thecanadianencyclopedia.ca/en/article/the-deportation-of-the-acadians-feature/. Seixa, Peter & Morton, Tom, The Big Six Historical Thinking Concepts. Toronto: Nelson Education Ltd. 2013. Is Anyone Actually Sad 2016 is Ending? As both an Acadian an a student of history I wish to congratulate the author on a good, well round-up analysis. I believe, however, that the British have been left off rather lightly on a couple of key points. I. As far as the security of the British settlers was concern it could have been an argument before the Fall of Fort Beauséjour but after? The french presence in the region was over, for all things and purposes, by that point and there was no threat that could be augmented by the Acadians. II. Concerning the aftermath of the Siege of Fort Beauséjour, the British where very much informed of what you describe as the Acadian side of the story and had actually accepted it at first since Monckton actually pardonned the Acadians in the fort without second toughts before being overuled by Lawrence, who probably saw it as a pretext to go with a second oath of alligeance. III. Speaking of said oath: There could actually have been a chance that Acadians would have signed a purely political oath of alligeance, and some even proposed to do so during the deportation, but Lawrence included swearing fealty to the king as head of the church witch was impossible to accept for catholics. All this tend to show that the deportation was less spontaneous that you describe and more an ambition long held by a Lawrence who was only looking for a favourable situation and a pretext to go forward with it. As far as human rights are concern here I believe the author is right to show caution. Nevertheless, it must still be said that (to the best of my knowledge aniway) that it was the only atrocity commited by a colonial european power against a fellow ”european” culture that would classify as a crime against humanity today (such moral calms didn’t, unfortunately, exist when came the time to deal with the indigeneous peoples). As we have proofs that many of the local british officers where, in fact, unconfortable with their orders I believe it is fair to say that even presentism doesn’t need to be invoked here: it was out of line even for the time. Your final paragraph really underscores how unjustifiable the Expulsion was. I think in my attempt to not sound biased towards the Acadians, I regretfully had the opposite effect and did not come down on the actions of the British and Governor Lawrence as harshly as I could have. As such, I want to thank you for your fantastic comment. Future readers will definitely benefit from your knowledge regarding the Acadian Expulsion. Acadians for lived the dream of not paying taxes. They lived a dream of just living, living from the land and trade. Half of me is of British, (Irish, Scottish the other spit upon races on the other side of the pond that served as the buffer races planted in Acadia while the deportations were gojng on. ). I myself remain loyal to all things Acadia and my indigenous mix. If the country of Acadia was allowed to exist, I would jump at the chance to move there. I despise the British of the past, they deserve no forgiveness. As attempts are still made to bury my proud Acadian-Metis history (even by my partial Acadian blooded PM), I cannot in my heart begin to forgive. we think that it was not right for the British to take the Acadia’s away from their families and homes and they had no reason to make them leave. the Acadia’s never ever were gonna do anything, they should of just let them stay at there homes. we believe that the British are little people who don’t have reasons for what they do. we also think that the British might of had a reason but it wasn’t a good one. we feel that Canada would be very different if the british didn’t import the acadian’s to Louisiana it would be a more french speaking country. It wasn’t necessary. The British didn’t have the right to split up families. The Acadians have the right to believe in what they wan’t to believe. They shouldn’t have been deported. They should have been left alone. They are people too. Their farms were seized, their homes were burned down and families were split apart. It was probably hard, frightening and difficult. Over 10,000 Acadians were removed from their homes. If you are still against this, imagine you were one of the Acadians. You are coming out of church on a Sunday in 1755 and the British had surrounded you, your family and your way home. The Acadian Expulsion was not justified because every single soul in this world can believe in whatever they want to. No one can make the rules expect God. When someone goes to church and worships God and gives their life to Him they should not be forced to change their lifestyle or beliefs. Remember God will always be on your side if you are on his. The British tried to take down the Acadians. They had to change their whole entire lifestyle. The British should not get to do that and I totally disagree. If the Acadians said the oath it would make them enemies of their homeland. IT’S UNFAIR TO TREAT THEM BY TAKING THEM FAR AWAY. IT WAS NECESSARY FOR THE BRITISH TO TAKE THEM AWAY. SOME FRENCH NEVER SAID THE OATH . THEY SHOULD HAVE AT LEAST GAVE THEM FOOD TO SURVIVE, TO GIVE THEM SOME RESPECT. THERE LEAVING TO A WHOLE NEW PLACE . THEY DON’T KNOW HOW TO SURVIVE THEIR OWN LIFE OR GET FOOD THEY DON’T KNOW WHERE THEY EVEN ARE, THEY LOST THEIR HOMES,RELIGIONS, JOBS, FAMILY. IMAGINE YOUR FAMILY MOVING AWAY FOREVER, YOU ARE JUST ALONE AT HOME WITH NOBODY AROUND, LOOKING OUT FOR YOU, TALKING TO YOU. YOU’RE FORCED TO BE PROTESTANT AND YOU HAVE TO WORSHIP A BRITISH GOD. We think that the acadian deportation was not justified for many reasons including, that the Acadians just wanted to live normally without wars in there lives. They also did not want to sign the oath because that would make them enemies of the french, the Acadians’ homeland.The Acadians were not doing any harm to the british, the only reason the Acadians were deported was because the british saw them as a threat even though the Acadians never fought or did anything to them in the first place.Many Acadian families were separated and many others homes and villages were destroyed or burned. Can you imagine that happening to you? We can’t, it’s just plain horrible. I am descended from the Acadians and grew up in an Acadian area of Nova Scotia; I’ve also majored in Human Rights at St. Thomas University, and focused on Genocide during my studies. By today’s standards, the experience immediately prior to, during and following the Explusion of the Acadians clearly meets the definition of one of several acts that constitute Genocide as per the UN Convention on the prevention and punishment of the crime of Genocide. There’s debate whether historical acts committed would be recognized as such or only acts committed post World War 2 once the Convention was established meet the definition. Either way, what’s important to recognize there is no justification the way humans treated other humans, historically and in todays society. We were not the first nor the last people whose society thrown upside down by the British and other Global powers that committed attrocities in society. Whats also important to recognize is that in the end, the Acadians of the Maritime provinces continue to prosper and exist and that culture developed into new cultures in the Cajuns. The Arcadian’s have my vote on this one because when the British did not let them grab supplies for there long destination. I think it is simply not fair for the French. Another reason was that families would be pulled apart like parents and their children. I think it is simply horrible. So who do I agree with? Both. *cue “huh”* I feel very bad for the Acadians and their family’s and homes, but the British had the rights to do this. They won this war fair and square. This tragedy will live on forever and ever, and the British will be known as the winners. It may not seem like a happy ending, but I think it was. These mistreated people found a new home in New Orleans, Louisiana, which I believe made up everything that they had gone through. So keep calm and eat some blackened meat and jumbo!!!! imagine if the british lost france what would happen now? I think that the British had the right to deport the Acaidians, but I do feel bad for the Acaidians because they had to move and start a new life and what if they didn’t find their family. The British should have sent the Acaidians away because they could just start killing the British and the British would be no more. The British were tired of the wars against the French. At least the British let the Acaidians stay for 40 years. This time i take take British because.They one the war and out smarted the French.And it is there land so they cant argue.They have to swear the aligence and sine a paper to say they will fight for British not there home country. it was the wrong thing to do to the Acadians,but it was better for both of them.the British wanted to end the 24 wars it was harsh but the wars were never going to end and the British had enough so they said to the acadians and said “i want to put an end to this,so let’s make a deal will have one more war,and who wins that gets to take over the land”.the British won it fair and square they shipped the acadians off but then i feel very sorry for the acadians family’s it breaks my heart to see them forced to leave i’m on both sides the acadians should have been treated better and the British didnt treat them very good but i wish we could change that but we cant because it happend and its over with.so pray for the acadian family’s and the British are very sorry for what they did we will learn from our mistakes and i hope moving foreword this will never happen again,i hope so. I think that what the British did to the french was awful and is sad but i am in the British side because i think after the Britain won the war they got to make up all the new rules and do what they would like with the land and whats in it . The British got to decide what changes were and what wanted to be added and what was best for them , but if the Britain kept the french there they would be in danger of being attacked again or being injured and losing more soldiers. So my conclusion is that the British had a smart and sad move but at least it was for the better. I am on the Acadian’s side for many reasons. #1 All of the land was originally theirs so if the British wouldn’t have even bothered for the land everyone would be fine. #2 The British only won because they had a bigger group of people. #3 All that the British wanted was the land for more population. #4 Acadians could not sign the oath because otherwise they would be fighting against their own home land.#5 The Acadians could not stay or else they would have to fight against their selves. I’m on the British’s side because they won the war fair an square.The British gave them 2 choices,to make them sign an oath and they could stay , or ship them to Louisiana,SOME decided to stay but lots of went to Louisiana.They let them keep there language and their religion. I am on the British side because the British won the war fair. They gave the French a choice to stay or go in a boat and leave to Louisiana! They also let the French to keep there language, there region! So im on the British side!